Poland's Kwiatkowski won a sprint finish in Bristol to claim a time bonus and take the yellow jersey by three seconds from Edoardo Zardini. 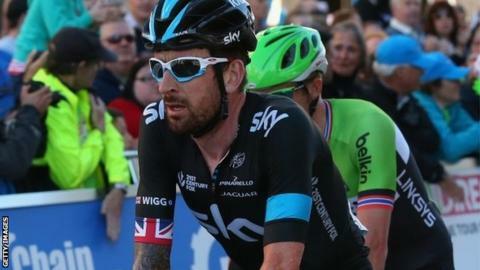 Wiggins finished six seconds behind Kwiatkowski and said: "I'm up there but on paper first place has gone now. "I can't see myself getting 27 seconds back but the podium's 12 seconds away." There are five stages left in the race, including an 8.8km time trial in London on Sunday where Britain's Olympic champion in the discipline could claw back some of the time he has lost. Wiggins added on ITV.com: "Kwiatkowski only has to have a puncture in the time trial. I wouldn't say the General Classification is over because finishing up there as the defending champion is important." The Pole, who rides for the same Omega Pharma - Quick-Step team as Mark Cavendish, beat Holland's Albert Timmer (Giant-Shimano), who had been prominent throughout the stage, and Belgium's Dylan Teuns (BMC Racing). Ireland's Nicolas Roche (Tinkoff-Saxo) sits fourth overall, 14 seconds adrift ahead of Thursday's fifth stage in Devon. Fellow Briton Alex Dowsett (Movistar) was in the day's six-man break, but a double puncture saw him fall back to the peloton. The key action came inside the final 3km when Timmer, who had been in the day's break alongside Dowsett, tried to accelerate up Bridge Valley Road following the peloton's passage through the Avon Gorge.